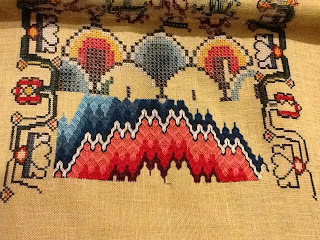 I'm making some progress on the Scottish Band Sampler (Scarlett Letter). The Hungarian flame stitch eats up a lot of thread and a lot of time. I'm liking the secondary pattern that is emerging. I'm hoping to finish this one entirely before I go to my sampler guild's retreat next weekend, but I would settle for a finish of the eyelets and flame stitch. Two friends came over on Thursday for a day of sewing. I've learned to select projects that don't involve too much concentration when we get together so I worked on a few different things. First, I made a few of these blocks. 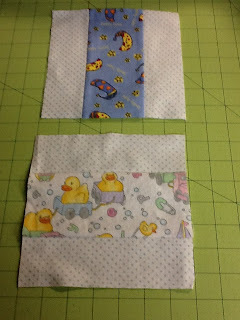 I picked up the flannel prints in the center at a guild meeting to make into a charity quilt. I've looked at the assortment and played around with a couple of different ways to make a block and finally came up with this to put into a rail fence pattern. 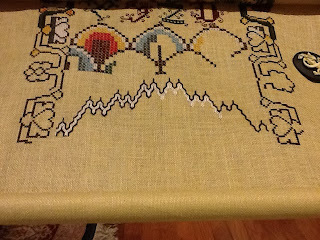 Progress continues on the Scottish Band Sampler (Scarlett Letter). I had set a goal of finishing this by the end of August-ha! As predicted in the instructions, the flame stitch is "quite challenging." For me, it was not the actual execution of the stitch, but the placement. What I have done follows the chart, but doesn't look like the picture of the finished piece. After frogging and restitching twice, I'm going with what I have now. I'm sure it will be OK and as long as I don't display the picture from the chart next to my completed sampler, no one will be the wiser.